I wish to bring to your attention the writings of RAS fellow Adrian Berry. You may know him as the Telegraph’s astronomy columnist, writing once a month in Britain’s most-read broadsheet and reaching a potential audience of more than half a million people. However, his recent column seriously calls into question his scientific judgement, to the extent that I believe his membership to this esteemed society should be reviewed. He states that Global Warming is a myth, that 500 million years of geological record have proved this to be so, that Carbon Dioxide has no effect on surface temperatures and that the un-peer reviewed writings of two authors (Svensmark and Calder) are somehow more credible than the tens of thousands of peer-reviewed science (see attached article). As a society, we should be all for scientific debate and should not just discard unpopular hypotheses. 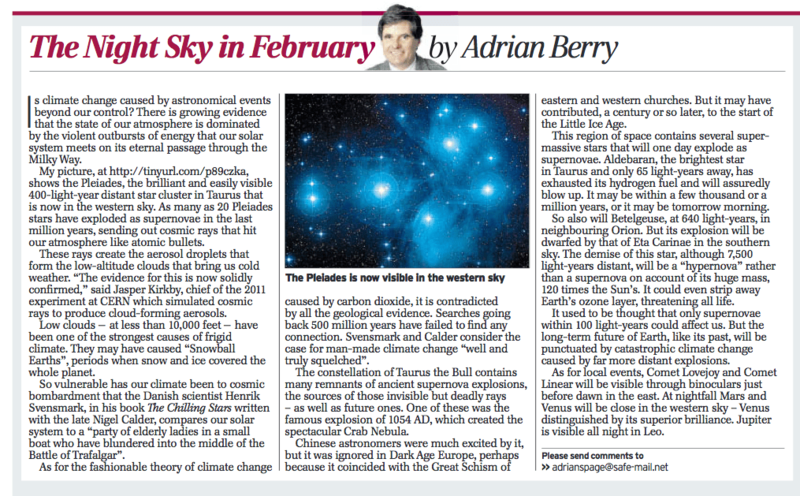 However, an unbalanced piece in the Astronomy column of a national newspaper is neither the way nor the place to do it. Instead it is a reckless attempt to discredit climate change in the eyes of the public. For a public-facing astronomer with a huge audience and the credibility of this society behind him, stating these concepts as facts is disgraceful. Standing by such members damages the reputation of our society and I believe (along with many other fellows I have spoken to) that his membership should be reviewed and revoked. UPDATE 1: A copy of this letter was forwarded to the members of the RAS Council. I shall update this post with any decisions that are made. UPDATE 2 (26/02/2015): The issue was extensively discussed at the most recent RAS general council. The final conclusion was that the specific case of Adrian Berry would not be taken any further. This was in part due to issues with free speech and the fact that, while being a member of the RAS, Berry did not specifically state his membership in the piece, so was not directly using it as credibility. The current process would also require a general vote of fellows to remove a member of the society. However, with the RAS bye-laws being updated this year, a new Code of Conduct will be created that fellows will be expected to ratify on a yearly basis. This code, which can be viewed on the RAS website, will more easily allow the RAS to discipline fellows breaking this code and take action more easily. I was not expecting the issue to even be discussed, so full credit to the RAS for listening, especially to President Martin Barstow who contacted me directly with the result. I understand the council’s decision in this case, especially as I feel any disciplinary action on Berry would probably serve to merely increase his (false) belief of a global warming conspiracy. But the new code of conduct is certainly a step in the right direction. Whether the RAS, which has never historically removed a member from it’s ranks despite worse cases than that of Berry, will actually discipline those breaking this code remains to be seen. Here is a of 885 peer-reviewed papers and authoritative articles, the majority of which discuss past climate changes and the role of CO2 in them. The list is from my book in which I describe the extensive geological evidence for CO2’s role in past climate changes in the last 500 million years and beyond. There’s a reason why global warming deniers like him get so much attention… might be worth checking his affiliations.